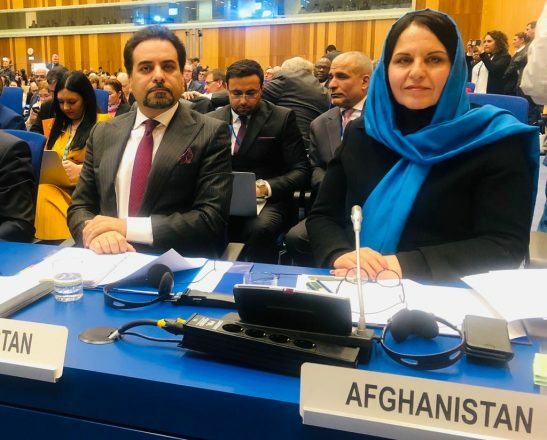 At the Ministerial Segment of the 62nd Session of the Commission on Narcotic Drugs (CND) which was held from 14 to 15 March 2019 in Vienna, Austria, the Head of the Delegation of Afghanistan, Deputy Foreign Minister Zaman, delivered a statement on the progress made and the challenges remaining in Afghanistan in counter narcotics efforts. The need for a full-fledge strategy that brings all the Afghan counter-narcotic efforts into one framework was emphasized. It was noted that the World Drug Problem requires a comprehensive, multifaceted, and concerted actions by all Member States at national, regional, and international level. In his statement Deputy Foreign Minister Zaman highlighted that illicit production, manufacture, trafficking in and diversion of drugs and precursors as well as state-sponsored narco-terrorism, transnational organized crime and the growing drug market are the most pressing issues of our time that continue to destabilize international peace and security. He also underscored that in Afghanistan, a country facing imposed conflict for over four decades, the nexus between narcotics and insecurity is well reflected in various UNODC and INCB reports. On the margins of the Ministerial Segment the delegation of Afghanistan held several bilateral meetings with Dr. Viroj Sumyai, President of the International Narcotics Control Board (INCB); Mr. Christian Leffler, EEAS Deputy Secretary Gene; Mr. Sherkhon Salimzoda, Director of the Drug Control Agency and a trilateral meeting with the heads of the delegations of the USA and Pakistan. 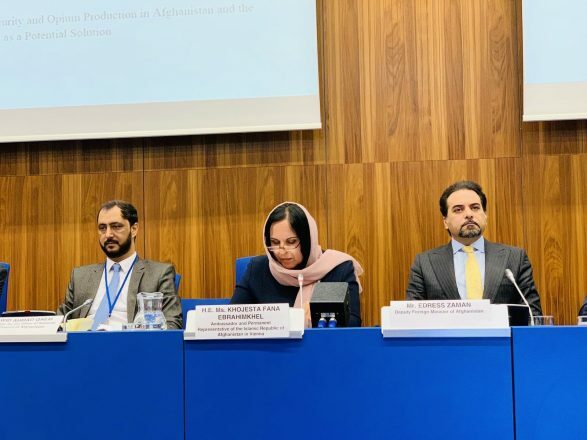 On Monday 18 March The Islamic Republic of Afghanistan hosted high level Side-Event entitled “The Symbiotic Relationship between Insecurity and Opium Production in Afghanistan and the Peace Process as a Potential Solution” chaired by H.E. Khojasta Fana Ebrahimkhel, Ambassador and Permanent Representative of Afghanistan in Vienna, became an important forum for the presentation of the latest efforts in the peace negotiations with the Taliban with a focus on the consequences on the future of counter narcotics activities. 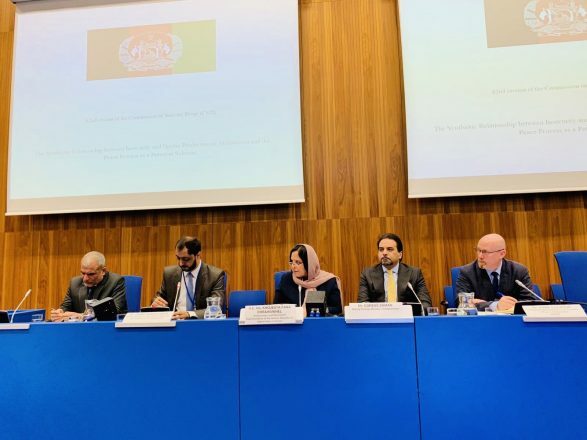 The government of the Islamic Republic of Afghanistan hosted a Side-Event entitled “The Symbiotic Relationship between Insecurity and Opium Production in Afghanistan and the Peace Process as a Potential Solution” on the margins of the 62nd session of the UNODC Commission on Narcotic Drugs on Monday 18 March 2019 at the Vienna International Centre in Vienna. Ambassador Khojesta Fana Ebrahimkhel, Permanent Representative of the Islamic Republic of Afghanistan to the International Organizations in Vienna, chaired the panel and highlighted insecurity as one of the main root causes of the drug problem in Afghanistan and the nexus between drug production and insecurity. Considering the link between insecurity and drug production, recent efforts to bring peace is giving Afghanistan a glimpse of hope. Deputy Foreign Minister H.E. Edress Zaman presented the latest efforts in the peace negotiations with the Taliban with a focus on the consequences on the future of counter narcotics activities. Most importantly, he outlined the dividends peace in Afghanistan would bring not only in the country but also regionally and internationally. However, as good as peace may sound in Afghanistan, H.E. Edress Zaman clarified how the Constitution of Afghanistan and the gains of the Afghan society are the red lines of the Afghan government in this peace process. Mr. Jawid Ahmad Qaem, Senior Advisor for the Office of National Security Council of Afghanistan, highlighted the importance of incorporating the drug component in the post-peace talks with the Taliban. In order to solve the drug problem, the post-peace approach will have to focus on the categories of landowners and farmers. He emphasized that drug trafficking in Afghanistan is not a national but a regional and international issue that should be tackled under the principle of shared responsibility. He called for creating a clear and complete picture of the situation of the drug problem in the Region, especially with regard to trafficking routes, to be able to create suitable solutions and policies to counter this international menace. Lastly, Mr. Mark Colhoun, UNODC Regional Representative for Country Office in Afghanistan, stressed the need to include rule of law, development and health issues relating to illicit narcotics in the peace process. The illicit financial flows generated and the harm to society are simply too large for these not to be included in the process. At the same time, the regional dimensions need to be considered as well, particularly when it comes to interdiction efforts.